Six contestants compete for the place of outgoing President Juan Manuel Santos, who received the Nobel Peace Prize in 2016 for his efforts to end the long-running civil war between his government and the guerrillas of the FARC or Revolutionary Army forces of Colombia. Under the agreement, the rebels agreed to lay down their arms, leave the jungle, and pursue their goals over politics rather than guerrilla warfare. The front-runners in the election to replace Santos could no longer deviate from the peace treaty. Conservative candidate Ivan Duque has taken tough positions against the FARC and openly rejects the deal, while leftist Gustavo Petro supports the deal and blames former president Alvaro Uribe for the FARC riots. Uribe supported Duque. Santos has not submitted a confirmation. Other important topics are unemployment, health care and corruption. Although there were isolated incidents of violence in the context of the elections, they were minimal, probably due to the dismantling of the FARC and the Department of Defense, which stationed 240,000 troops to ensure security during the electoral process. 2,000 election observers are present, and the Organization of American States has provided 78 observers to ensure the integrity of the process. 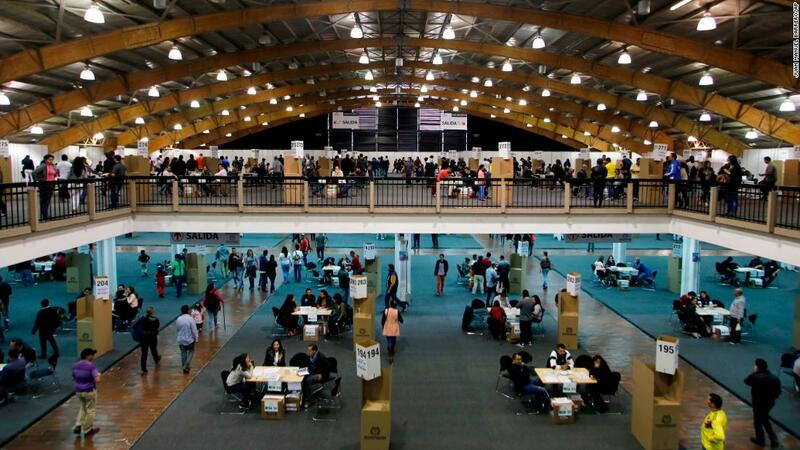 More than 36 million Colombians are eligible to vote, including more than 800,000 emigrants voting from 69 countries. Since no candidate will receive 50% of the votes, the election on Sunday is expected to lead to a June 17 outflow – probably between Petro and Duque, according to the pollsters. Santos faced run-offs in 2010 and 2014. Humberto de la Calle, 71, is supported by a coalition between the Liberal Party and the Indigenous Alliance. The former vice president and interior minister was tapped by Santos as chief negotiator for the FARC during the peace process. Duque, 41, of Uribe's Democratic Center Party served as senator for four years and as an advisor to the Treasury and the Inter-American Development Bank. He is also a professor and author who has written the book "The Orange Economy". If elected, he would be the country's first socialist president. Sergio Fajardo, 61, a mathematician and member of the conservative Colombian coalition party, is the former governor of the Antioquia department in northwestern Colombia and former mayor of Medellín. Petro, 58, is a former guerrilla fighter and economist who founded the Progressive Movement before becoming Mayor of Bogotá in 2011. He was formerly a member of M-19, another guerrilla group that became a political party, Petro has served three terms as a Congressman and one as a Senator. Germán Vargas Lleras, 56, is a center-right candidate supported by his own Radical Change party. He was Vice President under Santos, gained four terms as a senator and served as Minister of the Interior and Minister of Housing, City and Territory. Jorge Antonio Trujillo is a candidate for the party We are Colombia. A Christian pastor with a doctoral degree in theology, he served as a senator between 2006 and 2010. Polls close at 16.00. (5 pm ET), and the results are expected to be announced at 18.00. (19.00 ET). CNN's Chandler Thornton contributed to this report.